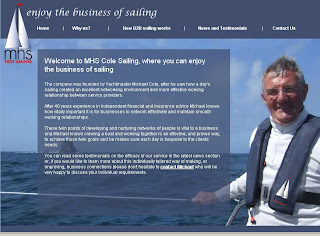 New Website Launched for MHS Cole Sailing! We're pleased to announce that we have now launched our new website. It will tell you everything you need to know about our services, what to wear and how to get to the boat, terms & conditions and all the other attendant information you will need for the day. Welcome to MHS Cole Sailing, here we will be posting testimonials from happy clients and also some latest news from the world of sailing and business networking, as well as information about our latest offerings and events. Welcome to MHS Cole Sailing, where you can enjoy the business of sailing. The company was founded by yachtmaster Michael Cole, after he saw how a day’s sailing created an excellent networking environment and more effective working relationship between service providers. After 40 years experience in independent financial and insurance advice Michael knows how vitally important it is for businesses to network effectively and maintain smooth working relationships. These twin points of developing and nurturing networks of people is vital to a business and Michael knows crewing a boat and working together is an effective, and proven way, to achieve those twin goals. So, if you would like to learn more about this unique way of making, or improving, business connections please don't hesitate to contact Michael on mhscolesailing@btinternet.com , who will be very happy to discuss your individual requirements.